Where to find St. Lucia hotels near an airport? Where can I find hotels in St. Lucia that are near tourist attractions? Are you ready to have serious fun in St Lucia? 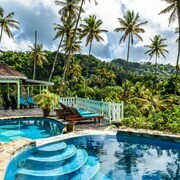 Expedia.ca is excited to help you find the best hotels in St Lucia. 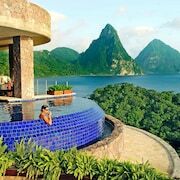 We want to give you a taste of the thrill of finding deep discounts on luxurious 5 star hotels in St. Lucia. You will have the opportunity to spend your days exploring the waterfalls, beaches, and tropical forests of St Lucia. Your nights can be spent relaxing in the lap of luxury at St. Lucia boutique hotels. We are experts when it comes to booking St. Lucia Vacations on a budget. Let Expedia.ca introduce you to amazing discount offers and deals when it's time to book your stay at a St Lucia hotel. 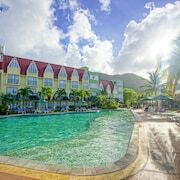 Are you looking for St Lucia hotels near popular attractions like Jalousie Beach, Pigeon Island National Park, and Reduit Beach? Imagine the joy of having all your needs taken care of at spectacularall inclusive hotels in St. Lucia. We want to help you stick to your budget so you have money left over to take advantage of great opportunities to ride horses on the beach, scuba dive in the crystal ocean, and enjoy pampering spa treatments. Our deals let you experience a taste of extravagance at a discount price. 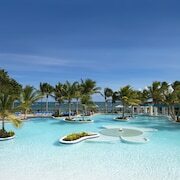 You can experience the opulence of 4 star hotels in St. Lucia near popular tourist hubs like Rodney Bay Marina. There simply isn't a better place to enjoy swimming, shopping, dining, and yachting adventures than this treasure on the coast. Are you looking for hotels in Soufriere, St Lucia? A stay in this lovely town will place you near many fabulous things to do in St. Lucia. Don't deprive yourself of the chance to view the famous Pitons. This twin pair of ancient volcanic plugs is a true geological rarity. Be sure to visit Soufrière Estate for a tour of an exquisite historic mansion that features a botanic garden and rare sulphur baths. You will simply love a visit to Anse Mamin. Tourists are invited to tour the vast grounds of this antique sugar plantation near a secluded beach with black sand. You won't believe the number of extraordinary hotels St Lucia tourists can choose from to host their needs. Expedia wants to help you locate wonderful hotels near all the great things to do in St. Lucia. We put the power to plan a perfect vacation right at your fingertips. What are the most popular St. Lucia hotels? Are there hotels in other cities near St. Lucia? What other types of accommodations are available in St. Lucia? Explore St. Lucia with Expedia.ca’s Travel Guides to find the best flights, cars, holiday packages and more!